Turkey and the US argue over the fall in the Turkish lira while the world watches nervously. Turkish lira falls: who's to blame? Following a series of dramatic falls in the value of the Turkish lira, the White House says it is monitoring the situation and that the US is not to blame, whilst the Turkish president accuses the US of treacherous behaviour. 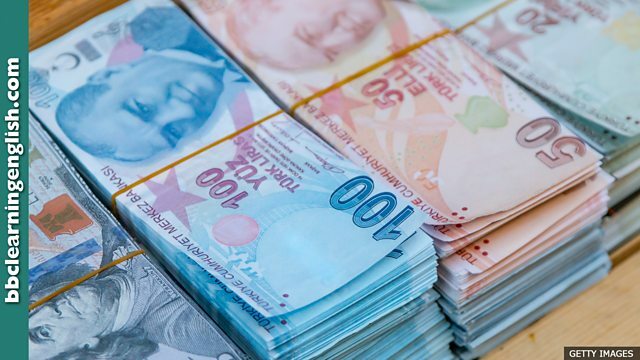 A White House economic advisor has said the Trump administration is monitoring the financial situation in Turkey very closely following the dramatic falls in its currency. Kevin Hassett said the sell-off could not have been prompted by additional US tariffs on Turkish steel and aluminium exports as the sector made up only a tiny part of Turkey's economy. President Erdogan has accused the United States of "stabbing his country in the back". • After a textbook pass from Rob, Dan scored a textbook goal! • The suspect was set free after a textbook legal defence made by her lawyer. • Everyone gets jitters before an exam. Don't worry. You'll do well. • He's nervous. Speaking in public gives him the jitters. I'll make him a cup of tea. • Reports are talking about large numbers of people, but I think they are overblown. • She's got such an overblown ego! She thinks she's the best at everything! Which of this phrases is NOT normally used in British English? There is a letter 'x' in this word. Which version of this word, meaning 'a perfect example of something', is correct? This word can be used in many different situations, with no change in meaning. We use the word 'overblown' to describe... what?